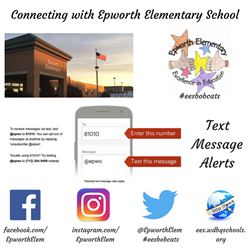 Epworth Elementary is officially on Twitter, Facebook and Instagram. We will tweet and post updates, highlights, pictures, videos and other items of interest as they happen throughout the days at school using the #eesbobcats hashtag. Follow us on Twitter at https://twitter.com/EpworthElem or you can find us by our handle: @EpworthElem. You can also find us on Facebook and Instagram!